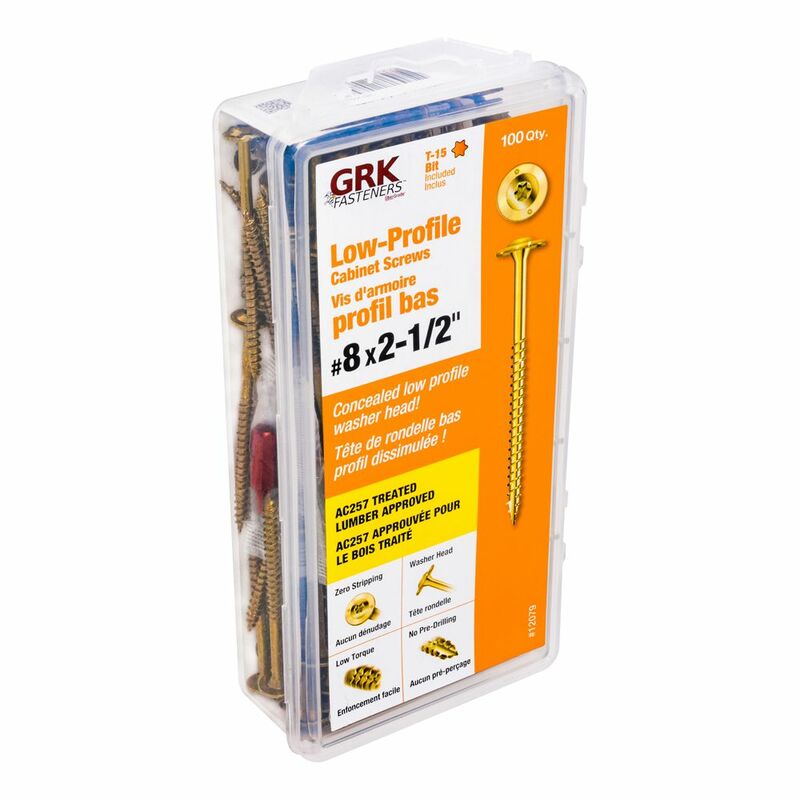 #8 x 2-1/2-inch Star Drive GRK Low Profile Cabinet(TM) Screws Climatek(TM) Coated Handy-Pak - 100pcs GRK Cabinet screws have a patented design for specific use in cabinet construction and installation. Cabinet screws are manufactured in a #8 gauge (4mm) diameter. These screws are thin enough to prevent most material splitting, while providing sufficient strength to guarantee a secure installation. The washer head design presses flush against any material surface. #8 x 2-1/2-inch Star Drive GRK Low Profile Cabinet(TM) Screws Climatek(TM) Coated Handy-Pak - 100pcs is rated 5.0 out of 5 by 1. Rated 5 out of 5 by James from Easy to use Used these to hang my new cabinets. Good strong screw and didn't need predrilling. Comes with the star bit needed to screw them in. Only issue was they were tough to find. 2 nearest stores didnt have them in stock so ordered them online and picked the only 2 boxes they had at the Avon, Ma store.